No walking paths throughout the beach line. They are limited to the resort's borders. Hyatt Zilara Rose Hall is an example of a high quality, but not pretentiously upscale all - inclusive resort in Jamaica. Attention to details such as a bottle of champagne next to the Jacuzzi, considered location of the tennis court, allowing the players to feel privacy, English speaking personnel and smooth atmosphere in general make it all satisfied and just right. The resort had been opened several months prior to our arrival. As a newly opened resort it did have some discrepancies such as a problem with the air conditioner in our room (which was fixed instantly after we notified the reception) and ongoing construction noise. We hope it was all temporary and so as the resort continues to function at its best, those discrepancies have disappeared. * Our best suggestion here is to call the resort and ask if any construction is still going on there and also ask if the air conditioner problems that you have read about have been resolved. 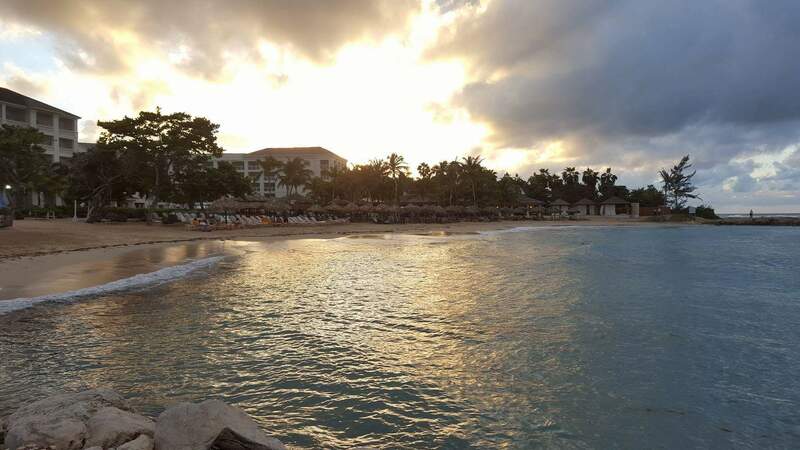 The Hyatt Zilara Rose Hall resort is located on the north coast close to Montego Bay city which is the second largest Anglophone (English is the primary language) city in the Caribbean. 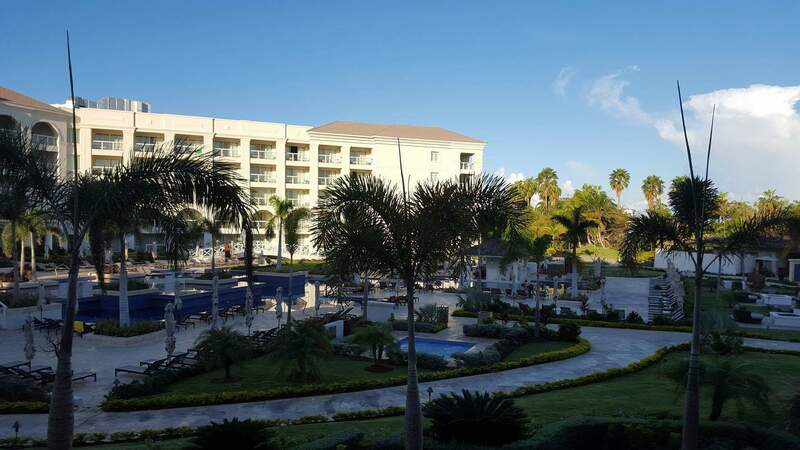 The main airport (Sir Donald Sangster International Airport) is 11 minutes away and the resort provides a round trip shuttle ride to and from the airport. The hotel's lounge is located right in the airport and it is easy to find. You just need to walk in and notify the staff about your arrival. We waited in the lounge for approximately 15 minutes before our shuttle bus was ready to take us to the resort. It was not crowded in the lounge and a comfortable sofa with cooled bottles of water provided an extra comfort while waiting. The territory of the resort is small. At first, it feels that the buildings, where the guests rooms are, are squeezed in a small square box. The pool, which separates the left and the right side of the resort, is the only public area and the central hub, where people walk around, to and from the restaurants or the beach, have drinks or relax on the lounge chairs. It means that sometimes it gets loud, but not excessively (I guess due to the fact the there was not many people at the resort in general during the time we were there). Hyatt Zilara and Hyatt Ziva are connected parts of the Hyatt Resorts. The Hyatt Zilara part is an adults - only section of the resort with it own pool and restaurants where guests from Hyatt Ziva don't have access. Hyatt Ziva Rose Hall is family - friendly part of the resort with a more alive pool and family entertainment program. Residents of Hyatt Zilara Rose Hall have full access to all amenities at Hyatt Ziva Rose Hall. Overall, the resort's modern design might slightly take away the feel that you are in Jamaica. But it's all atoned for by a kids free atmosphere, beachfront outdoor restaurants and the heartfelt service. Our standard room was newly renovated, neutrally decorated, spacious, and comfortable. Just the standard room in this resort has a view of the pool only. Option 1: Standard Room with the view of the Caribbean sea. Option 2: Swim Up Room - Ground floor room with a straight pool access from balcony. Option 3: Junior Suites: More spacious room with a separate living - room area (but not separate room) with a choice between the view of the Caribbean sea and the swim - up private pool. Option 4: Butler Suites: The most spacious suites in the resort with a separate living - room area (actual separate room) and a private butler service. All suites in this option face the Caribbean sea. All rooms, including the general standard room, have the bed options between one king bed or two double beds. We recommend to confirm your choice at the reception when checking in. As we stayed in the general standard room I will provide the description of our experience. The room was located on the second floor and had the side entrances which would lead either to the beach zone or close to the lobby area. As it used to be a hotel (Ritz - Carlton), not an all - inclusive resort before the renovation, the hall and the distance between neighboring rooms and rooms across are smaller than in other all - inclusive resorts. Since we faced the pool area sometimes we felt that people in the pool were loud, but it was right before the dinner time and the time when the pool closes (8 pm). It was acceptable and not disturbing. The room had a comfortable lounge chair, table with two chairs as well as spacious outside balcony with two chairs and a table. There were European sockets around the room including the bed, the lounge chair area, table and the bathroom (110V) . The drawers below the table TV had enough space to fit clothes from two luggages for five days. The mini bar had a variety of soft drinks, water and beer as well as Jamaican coffee and a medium size Jamaican rum. Snacks and juice were also present. The bathroom had a standing shower and two sink vanity. The size is comfortable for two people. Good quality toiletries and bathrobes and slippers also were there. Overall, the room was exactly as it was described and what the picture showed on the the resort's website. We had everything we needed for satisfied living. Regular and seamless cleaning of the room and daily replenishment of items in the minibar made it all personal, and yet not intrusive. The vast majority of the beaches on Montego Bay are private. What does it mean to you? You don't have access to the beach unless you are staying at the resort. 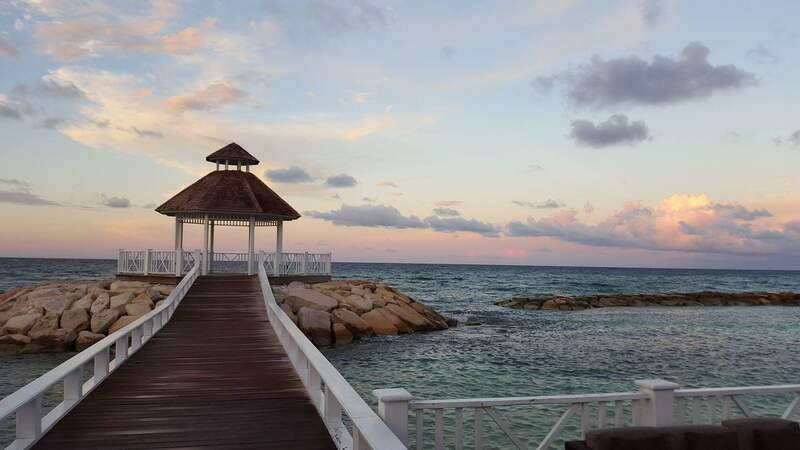 Unlike in other Caribbean destinations, resorts in Montego Bay don't practice shared walking paths throughout the beach line giving more preference to privacy to the beach attached to the resort. As a result the walking path in Hyatt Zilara and Hyatt Ziva is limited to the resorts' boundaries. The beach at Hyatt Zilara has a nice relaxed atmosphere. It is also quiet (kids free), clean, sandy and flat with a number of sun lounge chairs and cabanas (cabanas are for rent at an additional charge). 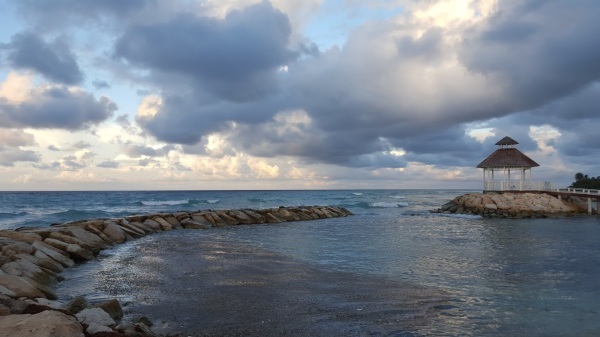 The view of the Caribbean sea is open, not obstructed by any objects. The water is pleasingly warm and calm. Several gazebos going in to the water as well as several nooks at the beachfront make it all very romantic and private to watch a truly beautiful sunset every evening. One of the ways to meet locals and to learn about Jamaican culture is to book a day trip or a tour with a local guide. The other way, is to step out from the comfort zone of the prearranged excursions and rent a car for a day! For the next two days we explored the island with stops at Ocho Rios, Kingston, Negril, Spanish town. The driving in Jamaica is left handed and not intense at all, except the Montego Bay area at evening time. It was a great experience which allowed us to see, speak and walk at non-touristy areas and fully feel the warmth and graciousness of Jamaicans. We would like to dedicate a special attention toward the high quality cuisine, wine list, mocktails and cocktails represented in the resort in seemingly endless varieties. Gourmets, guests on a special diet and guests who would like to try local food - everyone will be satisfied with the culinary options and I can tell even, with a certainty, impressed. The dining experience at any restaurant in Hyatt Ziva and Zilara is a gastronomy exploration supported by a professional service and lovely atmosphere. Smart casual clothing and long pants are required for dining at the restaurants. Both parts of the resort have on every corner a number of cafes, restaurants, bars, tavern, shack, etc. One of the highlights of this resort is definitely the authentic and delicious culinary options. Hyatt Zilara in Jamaica successfully combines excellent customer service, yet a feeling of privacy, together with a high standard of quality. The resort has its own style and an atmosphere which can be described as casual elegance, and guests who understand what to expect from the resort after reading our review will not be disappointed. Hyatt Zilara is for guests who appreciate quietness, convenience and are looking for a thoughtfully chosen location with an exceptional Caribbean Sea view. ​* we are not associated with any resort we review. Our assessments are purely based on our observations, knowledge and experience! ​* some of the photos on the display are the property of the Hyatt, but have been personally confirmed by us for accuracy.